Two social entrepreneurs came up with an answer that sprang from their personal experiences to help senior citizens. Bengaluru: The city has many NGOs that cater to the elderly and many more healthcare service companies that provide postoperative care to elderly patients, but what about those senior citizens who don't want to be in an NGO and just want a lending hand to have a fulfilling day? These two social entrepreneurs came up with an answer that sprang from their personal experiences. “My parents are in their early eighties and stay in Thiruvananthapuram and despite me telling them to come to Bengaluru, they prefer to stick to their roots. There are times when they need sudden help with emergencies. Thankfully, my father has his brothers and other relatives there. 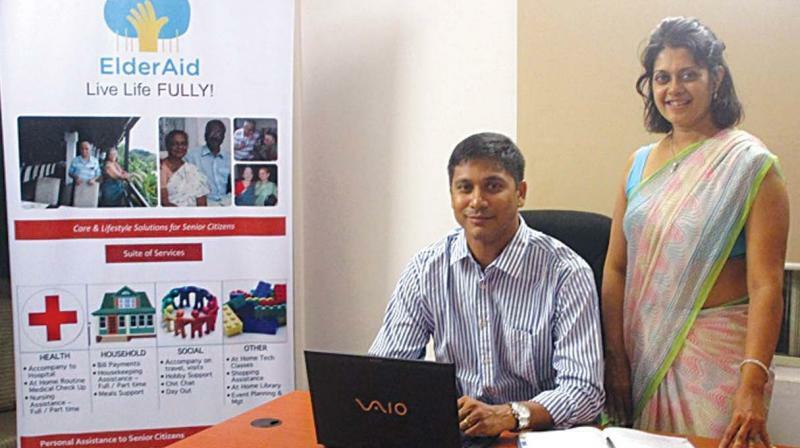 But, this thought in itself pushed me to open an enterprise that looks into this issue,” says Mr Santosh Abraham, founder-director of ElderAid Wellness. Mr Abraham, along with his friend Dr Vandana Nadig Nair, started the service in 2015. Dr Nair also has a somewhat similar story behind this venture. “ElderAid Wellness happened in response to a growing need within my own extended family – elder aunts and uncles in Bengaluru with children in other cities or countries who needed help and support. It is our dream to be the ‘proxy child’ of these senior citizens and help them fulfill their needs,” she says. The concept involved six to seven months of market survey, which made them realise that people in their post-seventies are overwhelmed by mobility issues. This gave birth to the enterprise which would cater to health services, concierge, wellness, shopping assistance, social visit chat and hobby support. “It involved accompanying them to hospitals to taking them shopping and other social visits. We decided this is the key area that needed attention and help,” says Mr Abraham, who informs that they have a decent number of customers at this nascent stage. The 2011 census also revealed that 15 million elderly people live alone and three-fourths of them are women. Demographically, the proportion of India’s elderly population has grown from 5.6 percent in 1961 to 8.6 percent in 2011, according to the Ministry of Statistics and Programme Implementation. Such whopping numbers do reflect the need for care and help for the elderly in their sunset years, considering the rise in number of nuclear homes with no joint families for care and support. “Our clients are people who have vibrant lives, aspirations and hobbies. Whether it is playing bridge in the club or wanting to go to the church or temple, or attend a family member’s wedding, or even learn how to operate their new smartphone, we support it all. That is mainly because the children are not with their parents," explains Mr Abraham. This social enterprise runs on a cost-based and not profit-based model, says Mr Abraham, and adds that the charges are as minimal as one's Bescom bill. “The idea is to reach out to many and help them with their daily chores, just like it would have been if they had their children with them. The eight-member team helps the elderly with their second innings in life post-retirement, by trying to facilitate a job which is less demanding,” he says. Commenting on the big players, Mr Abraham says that there are many healthcare companies, but there aren’t many care organisations that can holistically help senior citizens address their healthcare, wellness and lifestyle needs and that is where ElderAid comes into the picture. “This instills confidence in the elderly and they feel alive as we believe that there are many elders who can add value to society and there is a lot of wisdom that can be used in the right way," he says.